Be sure to read a corollary article that I posted a while back on Blood Atonement. In that article, I exposed the failure of futurist eschatologies to consider this critical doctrine. Wright refers to the Song of Moses as “a vital chapter in this great story” i.e the story of Israel (N. T. Wright, Paul and the Faithfulness of God, (Vol. 1 & II, Minneapolis, Fortress, 2013), 77). “Deuteronomy provides a fundamental theological resource for Paul’s attempt to explain the puzzling experience of his own missionary activity. Gentiles believe; Jews do not. What is happening here? Deuteronomy offers Paul not only the explanatory narrative pattern (covenant election, Israel’s unfaithfulness, God’s judgment followed by God’s ultimate gracious act of reconciliation / new creation), but also the ‘jealousy’ theory, based on Deuteronomy 32:21, as an explanation of God’s surprising decision to bring many Gentiles to salvation before reclaiming unfaithful Israel.” (Richard Hays, Conversion of the Imagination, (Grand Rapids, Eerdmans, 2005), 181). Other than these few scholarly references my purpose here is not to extensively chronicle the scholarly attitude and comments about the Song. For those who wish to look into that, I recommend J. Ross Wagner, who has an excellent discussion of Paul’s use of the Song of Moses and how it impacted the entire prophetic thought of the NT. (Heralds of the Good News, (Leiden, Brill Academic, 2003), 190, 189f). “Moses recited to Israel a poem of hexameter verse, which he has moreover bequeathed in a book preserved in the temple, containing a prediction of future events, in accordance with which all has come and is coming to pass, the seer having in no whit strayed from the truth” (Antiquities, 4:303). As Wright says of this comment by Josephus, “It is the kai genetai which gives the game away; he believes himself, or is happy to give the appearance of believing himself, to be living in the long fulfillment of the Deuteronomic prophecies.” (Faithfulness, Vol. I, 2013, 131). 1. The Avenging of the blood of the martyrs. This is more than remarkable, since Israel as a nation was “brand new” when Moses gave the Song, and as far as the record of martyrdom is concerned, from Genesis 4 and the killing of Abel, to the time of the Song, we have only a handful of martyrs mentioned. This reinforces the point we will make below that the Song is not about Moses’ or Israel’s contemporary situation. It dealt with a time and event far removed from Moses. 2. The related theme of making Atonement for the land and the people. What we have here is a reference to the doctrine of Blood Atonement. I am convinced that this doctrine that lies behind many New Testament texts, yet, few commentators take note of that connection. These two motifs are inextricably bound together. And to say that they are incredibly important for the study of eschatology is an understatement. To properly appreciate the meaning and application of the Song, it is critical to set the context. Moses foretold that in the last days Israel would become “utterly corrupt.” This would not take place imminently, but after Moses’ death, and “in the last days.” (Some believe that the term “latter times” here means simply “in the time to come” or something akin to “in the years to come.” I believe, however, that there is much more than that at stake, as a closer look at the body of the Song reveals). ✡ Moses was specifically told that the Song was a description of events to take place after “many generations” (32:7f). So, we cannot miss the point that the Song is about Israel’s ultimate fate, her last end. This is not about the “end of time” or, the end of the Christian age. (The incredible significance of the Song for understanding Biblical eschatology seems lost on many futurists. As I point out in the article linked above, in my 2016 debate with (Amillennialist) Dr. David Hester, I noted that the salvation of Israel foretold by Paul in Romans 11 would be in fulfillment of Isaiah 27:10f, which cites the Song of Moses. I made the argument three times. I observed that the Law of Moses would remain valid until the fulfillment of the Song – at the coming of the Lord- which negates Dr. Hester’s paradigm. He seemed oblivious to the force of the argument and never said a word in response. Literally not a word). DVDs and MP3s of that debate are available from me, and, a book will be forthcoming. Does not the fact that the Song is about Israel’s “last end” indicate that beyond that “last end” Israel would not have a distinctive place? What does “last end” mean? So, the Song of Moses informs us that it is about Israel. It is about Israel’s last days. It is about (as the climax of the Song) the avenging of the martyrs and YHVH making Atonement for the land. With this in mind, let’s do a brief (very brief) survey of the issue of martyr vindication. (For an extended discussion, see my We Shall Meet Him In The Air, the Wedding of the King of kings). I will present here an edited and revised portion of a paper I presented at Criswell College in Dallas, Tx. in 2012. My paper was on the Preterist Perspective of the Millennium. My approach in that presentation was that martyr vindication is a key to understanding Biblical eschatology, even the doctrine of the Millennium. I hope that the reader can see from this brief overview of some key Biblical texts that the doctrine of Blood Atonement is a critical element of Biblical eschatology. We will present that in the next installment. 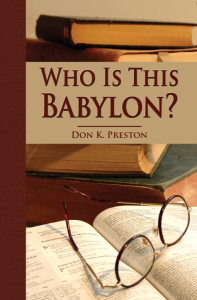 For more on the incredible significance of martyr vindication for understanding Biblical eschatology, see my Who Is This Babylon. This book has an in-depth discussion of martyr vindication and eschatology. Nothing else like it!